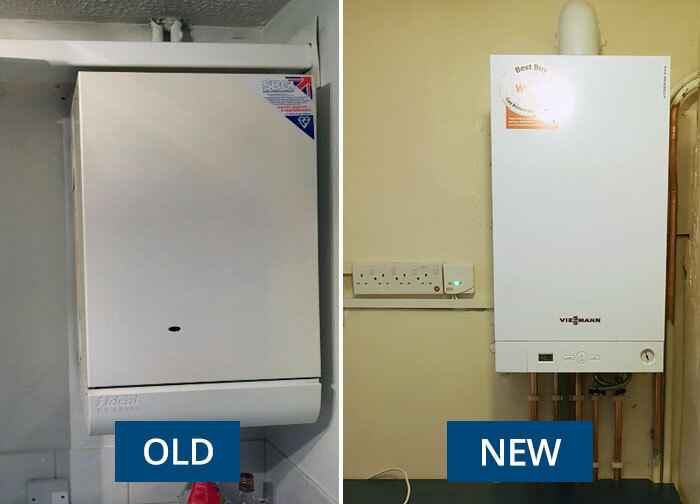 One of the most common questions we get from our clients is “replacing old boiler with Combi boiler – why is this the right choice?” Modern combi boilers are the most efficient type of boiler, and so replacing an old boiler with combi can save you a lot of money. It is also easier on the environment. After the initial investment has been recouped, you’ll be left with fast, reliable heating and hot water. The substantial savings will really add up over time. More than half of all new builds in Britain now come with combination boilers (known as combis). This is a space-saving innovation that combines both a high-efficiency water heater and a central heating boiler into one unit. An additional hot water cylinder is not required, which means a lot of saved space, particularly in flats. If you like steaming hot showers, replacing an old boiler with a combi boiler is a smart choice. It delivers hot water at a high pressure through your bath, basin taps and showerhead without the need for an external pump. Combi boilers do not require a tank installed in your roof space, so it needs less pipe work. This means that material and labour costs will be reduced. Why are people replacing an old boiler with a Combi boiler? One of the main reasons that people are replacing old boilers with combi boilers is down to energy efficiency. With the prices of electricity and gas increasing year on year, any savings is worth looking into. A savings of more than 40% on energy bills? That is a huge amount of money each year that could be in your bank account rather than in the pockets of your energy company. Annual maintenance costs are also reduced, which adds to the total cost savings, thus making an A-Rated combination boiler the smart choice. 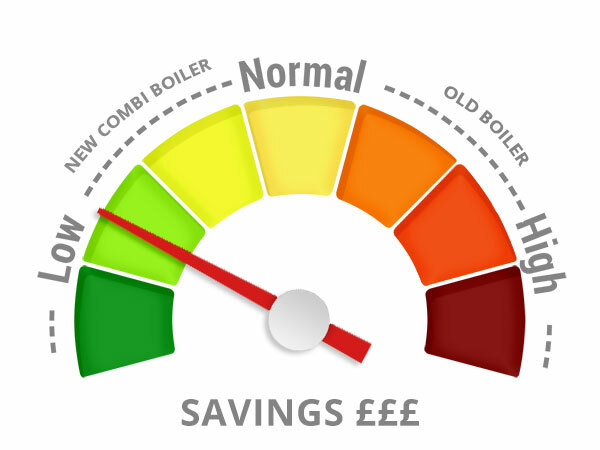 The Energy Saving Trust estimates that replacing an old boiler with a Combi boiler could save you on average, £340.00 per year based on a 3 bedroom semi- detached house. When you add that to annual maintenance savings, you could recoup your expenditure within a 3 to 4 year period. A new A-rated condensing combi boiler will save energy, reducing your carbon footprint and save you money. Another popular reason for installing a combi boiler is that it can save you a lot of space. You can say goodbye to water tanks, which is especially advantageous in flats and smaller row houses. Larger combi boilers are suitable for 3 and 4 bedroom houses with more than one bathroom and capable of running two showers simultaneously. Just think about what you could do with all of the space in your airing cupboard! You will need a dedicated space for your combi boiler, but they are typically much smaller and can fit into tighter spaces. Our clients are replacing old boilers with combi boilers because they fit well into a busy family lifestyle. With a regular boiler, your household only has a limited store of hot water. When this runs out, you need to wait for the boiler to fire up and produce more hot water. With a combi boiler your hot water is virtually unlimited; only your mains water pressure limits the amount. Why is a Combi boiler so much more efficient than your old boiler? Think about it this way – your boiler does a lot of work on a daily basis. It takes a huge amount of thermal stress to heat your home, and this can result in corrosion over time. When your boiler becomes corroded, its efficiency is reduced, sometimes down to less than 50% of its original capacity. Simply put, that means that for every £100 you are spending on your energy bills, up to £50 (or even more) is ending up down the drain – literally. When replacing an old boiler with a combi boiler (particularly a new, A-rated condensing model) you will be upgrading to a unit that is more than 90% efficient. Choose to add a smart control to your combi boiler and you can achieve over 92% efficiency. (92% efficiency complies with the new Boiler Plus Legislation applicable in England, and soon to be in Wales and Scotland). If efficiency is your biggest priority (and why wouldn’t it be?) you will likely be interested in the Viessmann Vitodens range. Viessmann combination boilers are Boiler Plus compliant. They come with free weather compensation and surpass the Boiler Plus Legislation, with the V200 model achieving up to 98% efficiency. This means that you lose less than a few pounds per £100 that you spend, saving you a lot of money over the course of a year, and even more over a decade. In addition to the benefits we’ve detailed above, you’ll notice these immediate benefits after replacing an old boiler with combi. Premium boilers from companies such as Viessmann can operate between 92- 98% efficiency! We recommend you engage a Gas Safe registered company when replacing an old boiler with a combi boiler. Make sure you get 3 like for like quotations for a fair comparison. Did the company arrive on time? Keep you waiting for prices? What after care service will they provide, and who should you contact? Did they give an accurate installation time and advise of any disruption? Replacing an old boiler with combi boiler on my own? We strongly recommend you do not undertake this type of work unless you possess the correct qualifications and experience. Even if you manage to do this without blowing up your home (and your neighbours), the boiler installation will have not been set up properly and all manufacturer warranties will be null and void. 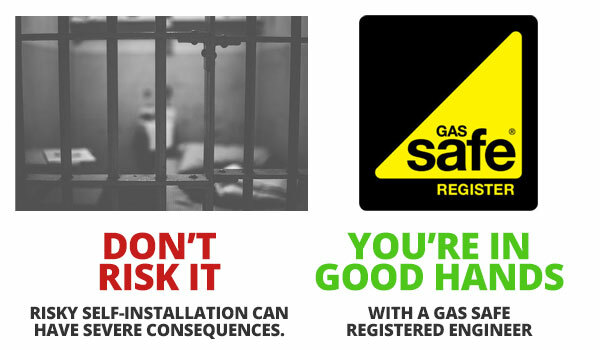 It is also a criminal offence to install any gas appliance if you are not a qualified Gas Safe registered engineer. The HSE (Health and Safety Executive) have no tolerance in these matters – you could go to prison. What will it cost replacing old boiler with a combi boiler? Makes and models vary between £1800 to £2400. These prices will get you a combi boiler installed with a decent warranty. If you need additional equipment like Vertical flues, Gas upgrades, smart controls, power flush, and most importantly a magnetic system filter, this could increase to £2900. At B T Morgan Heating Engineers, we are Viessmann Approved installers. This means you will get the highest quality boiler installation at a fair price, with extended 7-10 year warranties and excellent after-sales care. You can a free online quotation on our homepage in 5 easy steps, with finance options on boilers also available. Have a look at our blog, New Boiler installation Pay Monthly, for more information.